Two new Scottish newspaper titles, The Herald on Sunday and Sunday National, have published their first editions. The move by owners Newsquest follows the closure of its previous Sunday paper, The Sunday Herald, which shut down after 19 years on 2 September. It means the pro-independence National, launched in the run-up to the 2014 referendum, and The Herald have now become seven-day operations. It is understood the Herald on Sunday will remain politically neutral. 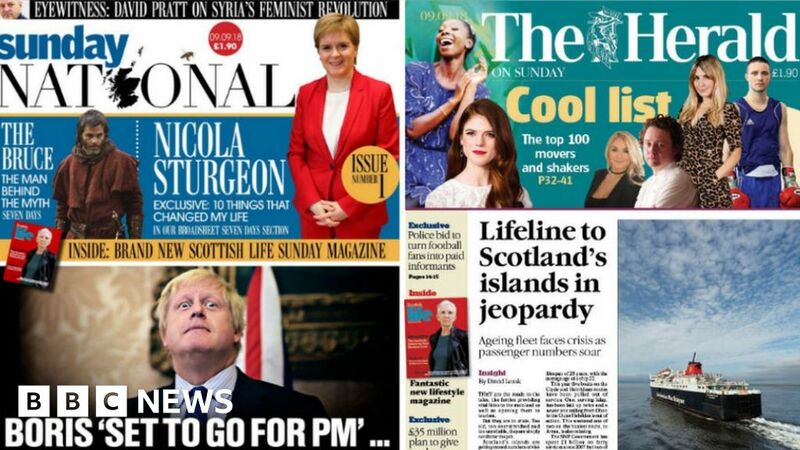 The National on Sunday marked its launch with an interview with the SNP’s Westminster leader Ian Blackford. In it, Mr Blackford predicts former foreign secretary Boris Johnson will bid to oust Theresa May as prime minister – and spark a second referendum on Scottish independence. The Herald on Sunday kicked off with an investigation into Scotland’s island ferry service, warning the “lifeline vessels” are not fit for purpose. The Sunday Herald was the first newspaper to publicly back a “Yes” vote in the Scottish independence referendum in 2014. However, despite seeing a brief circulation boost, it went on to see its sales slump, with the latest figures showing an 18% drop in print sales compared with 2017.